Cyber Essentials - System Force I.T. For most organisations and companies these days, maintaining a high level of cyber security couldn’t be more important. Not only is it key to protect customers and users’ personal and financial information from hackers, but it’s also vital to keep computer systems safe from any kind of threat which could compromise their functionality. With many high-profile cyber crime incidents having been seen in the media recently, the Cyber Essentials scheme is becoming ever more prevalent. With the imminent implementation of the (GDPR) General Data Protection Regulation, many firms are bracing themselves for a new generation in privacy management. Organisations with Cyber Essentials Certification are said to be more advantaged because they offer a guideline for various standards such as GDPR, which is essential in illustrating how an organisations handle big risks. Cyber Essentials demonstrates that your organisation is security conscious. It shows you value the importance of taking measures to secure your customers data. Being Cyber Essential certified gives assurance to your customers as you are in compliance with a Government Recognised level of information security. 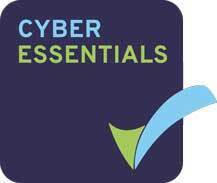 Cyber Essentials helps implement basic, yet crucial information security measures within your organisation. We will help you achieve certification quickly and efficiently, Fill in the form below and we will contact you.